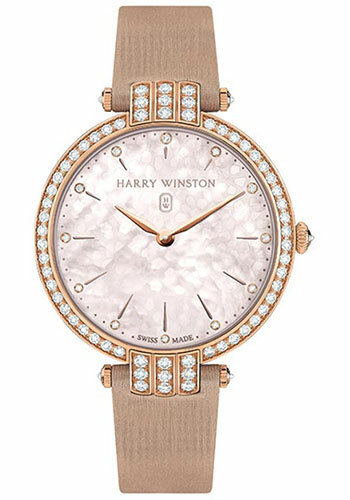 36 mm 18K rose gold case set with a total of 108 brilliant cut diamonds (1.64 carats), beaded mother-of-pearl dial with diamond hour markers, quartz movement, satin strap with diamond set 18K rose gold ardillon buckle. Water resistant to 30 meters. 36 mm 18K rose gold case set with a total of 108 brilliant cut diamonds (1.64 carats), beaded mother-of-pearl dial with diamond hour markers, quartz movement, 18K rose gold bracelet. Water resistant to 30 meters. 36 mm 18K rose gold case set with a total of 455 brilliant cut diamonds (7.0 carats), beaded mother-of-pearl dial with diamond hour markers, quartz movement, 18K rose gold bracelet set with diamonds. Water resistant to 30 meters.